The roof of the Codori Barn on the Emmitsburg Road is being re-shingled. This view was taken facing northwest at approximately 1:20 PM on Friday, August 27, 2010. 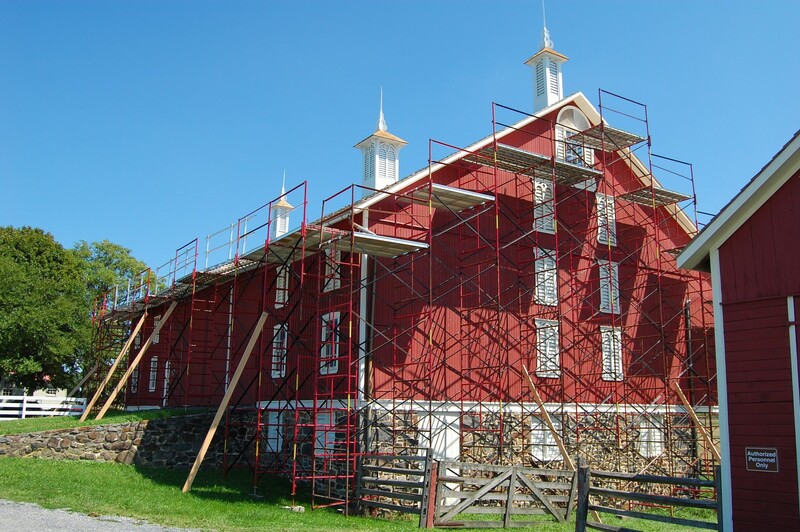 The Codori Barn has been surrounded by scaffolding this summer as it undergoes restoration and repair work. 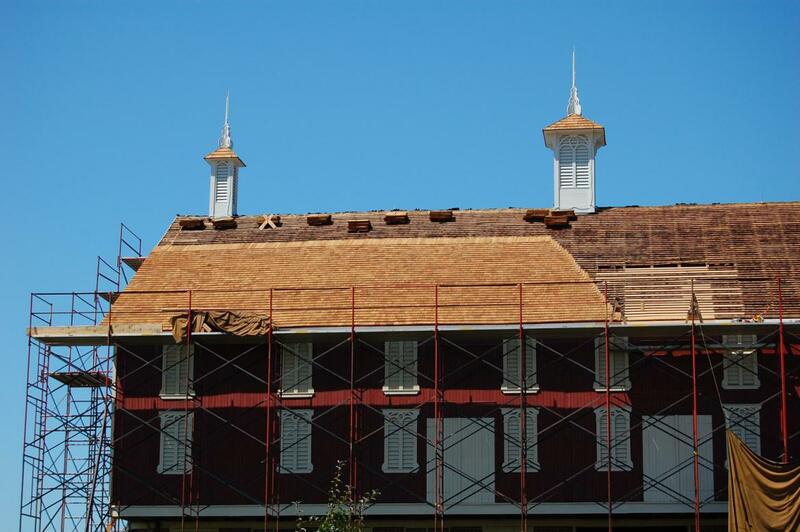 Currently, new roofing shingles are being applied to the eastern portion of the roof. 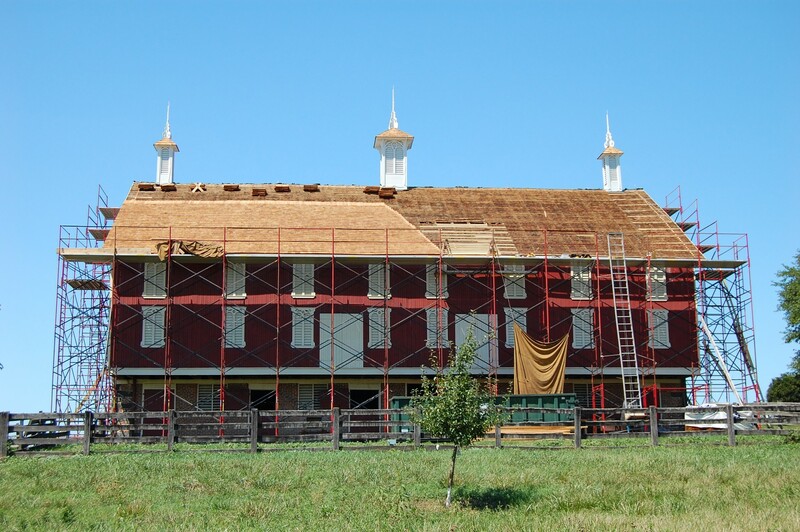 We’ll take a walk around the property and show you a few shots of the restoration work. 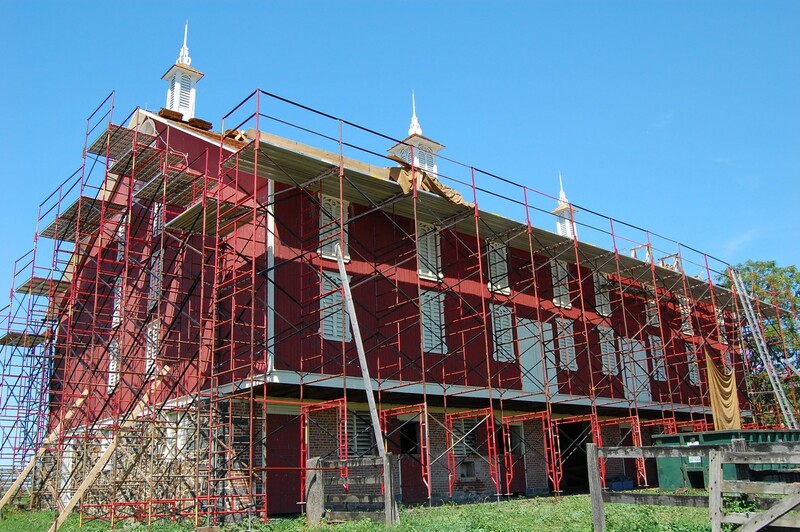 The three ventilator spires, or cupolas, on top of the barn were stripped and repainted in July. This view was taken facing northeast at approximately 1:20 PM on Friday, August 27, 2010. Here’s a closer view of the roof, including two of the cupolas. 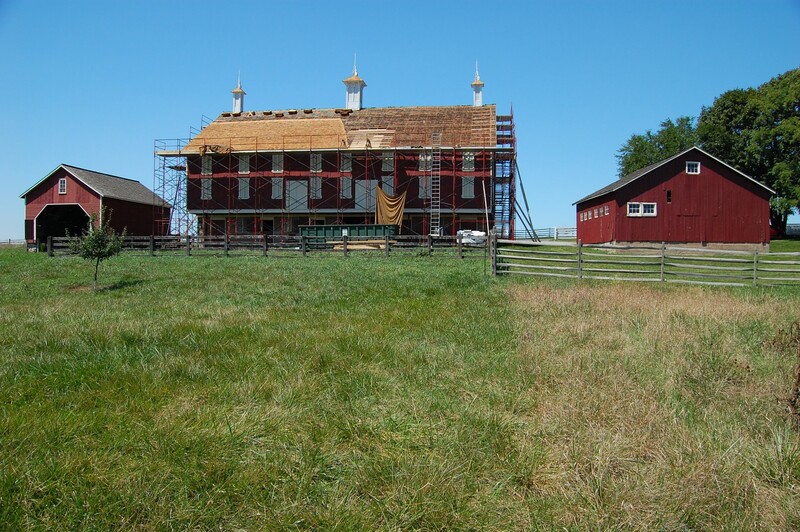 The cupolas were removed in the 1940s and were restored by the National Park Service in 1987. This view was taken facing northwest at approximately 1:20 PM on Friday, August 27, 2010. 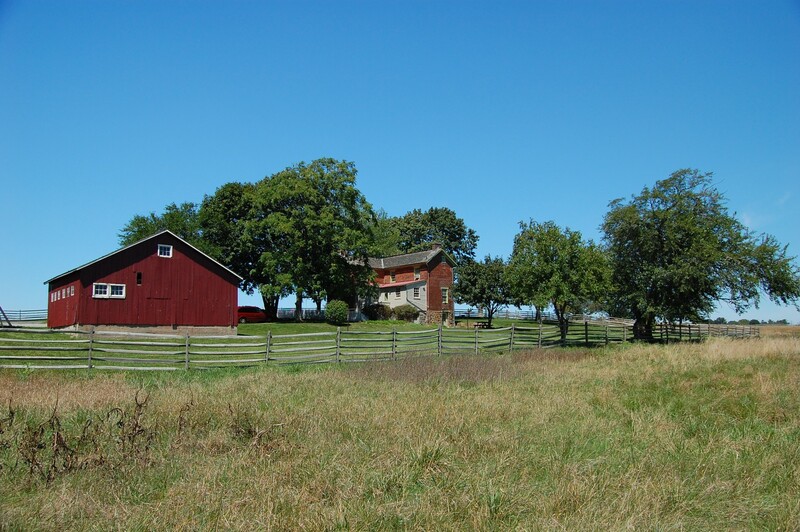 The Codori Barn is known as a bank-barn, because of the bank of earth that gives access to the barn’s second floor. 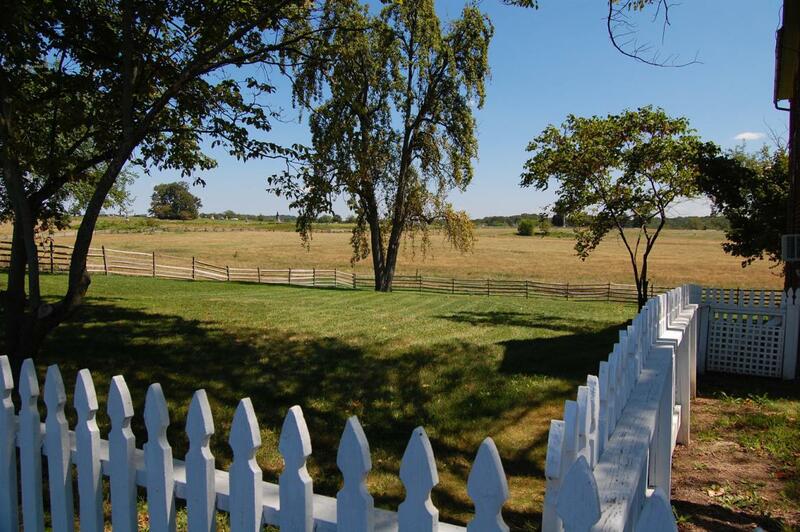 This view was taken across the Emmitsburg Road. This view was taken facing south at approximately 1:20 PM on Friday, August 27, 2010. The central cupola fell off due to lack of maintenance in the 1940s, and the two wing spires were removed during a re-shingling project in the same decade. 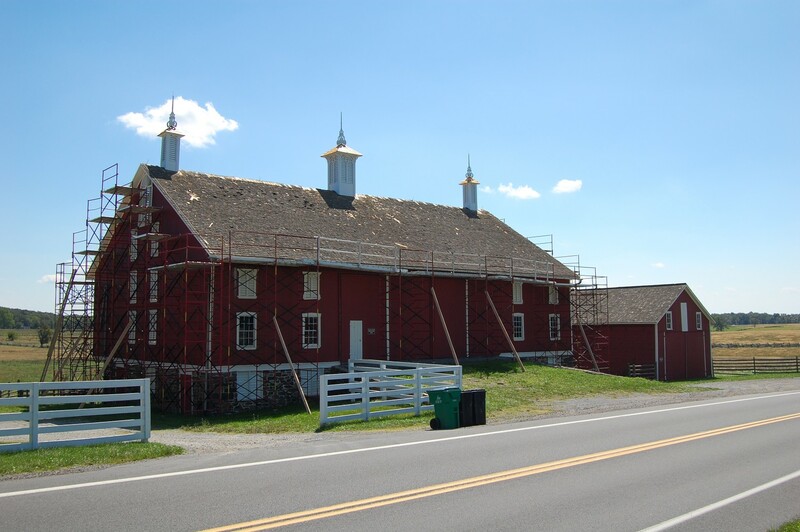 When the decision was made to replace the cupolas in 1987, the cupolas of the Eisenhower Farm barns were used as a model. This view was taken facing north at approximately 1:20 PM on Friday, August 27, 2010. The Codori Barn today is not the same barn that was here during Pickett’s Charge. This barn was built in 1884, six years after Nicholas Codori’s death. This view was taken facing northwest at approximately 1:20 PM on Friday, August 27, 2010. Nicholas Codori bought the property in 1854 and tore down an existing log structure, building the two-story structure in the center of this view, which currently serves as a residence for the National Park Service. This view was taken facing northwest at approximately 1:20 PM on Friday, August 27, 2010. Nicholas Codori never lived in the house. 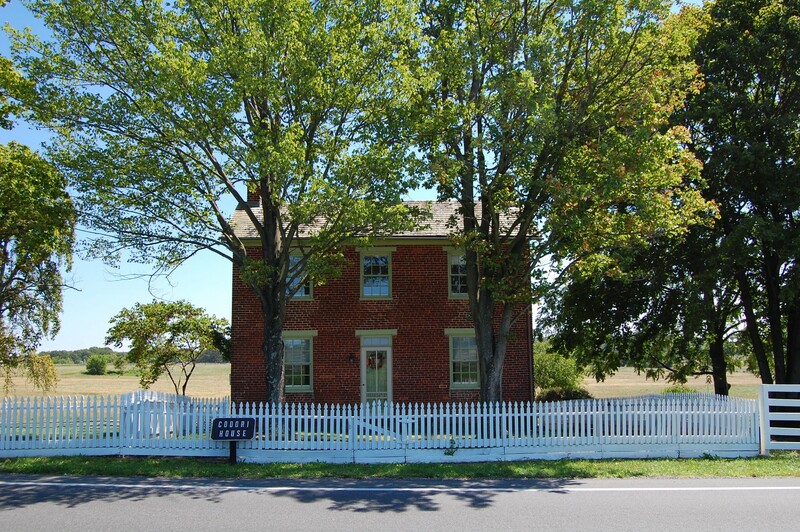 As the wealthiest butcher in the town of Gettysburg, the farm was a tenant farm, whose purpose was to raise cattle for the butcher business. This view was taken facing southeast at approximately 1:20 PM on Friday, August 27, 2010. The yard to the north of the house. The famous “Copse of Trees/Clump of Trees” is in the left background on Cemetery Ridge. This view was taken facing east at approximately 1:20 PM on Friday, August 27, 2010.